Whether you train your dog to track for competitive sport, for fun, or for a potential working career, it is imperative to begin your training positively and in an ordered fashion so as to achieve the highest level of consistency and success. Working with puppies can provide some of the most entertaining training opportunities! They are like small sponges, always eager to work with a handler and to learn. This is the perfect starting ground for many training purposes, but additionally, there are some games you can play with a puppy that really hone in the tracking ability at a young age. Dogs use their noses to track, and while we can’t show them how to do that, we can encourage the natural ability. Games are a fantastic way to do this! Hide N’ Seek is one of the games that early on encourages a dog to look for a missing item, you! Particularly if you are dealing with a very owner loyal breed like a German Shepherd, this game plays on the puppy’s desire to know where their owner is. I like to begin playing this game with a 3-4 month old puppy in the house. I simply have one person hold the puppy a short distance away from me while I excitedly speak to the puppy. You’re wanting to both excite the puppy but also frustrate it since it can’t come to you. I then run a short distance and duck behind something like a couch, wall, or small barrier and then ask the puppy to Come Find Me! At this stage of the game the puppy is mostly working on where he saw you move towards. That is okay. When he finds you, a super enthusiastic greeting and a Good Find! is a perfect reward. If desired, have a favorite toy and engage him in a game of tug. As the puppy catches on and ages, the game simply gets harder. This requires the puppy to no longer only use his eyes but to also switch to scent work. He will both air scent and go to ground work. A variation of this game uses toys instead of you. Find It is a game based on scent detection work. Select a toy your dog loves immensely. Engage him in play with the toy for a few moments to excite him. Then, have a second person hold the puppy and take his toy and hide it near by. The first times hide it in an easy to locate place with part of the toy exposed. He will start his search by visually looking for the toy, but to truly find it will require scent work. Both Hide N’ Seek and Find It are games that puppies eagerly love to play, but they also help the puppy learn to find a missing or hidden item. They use their natural ability, and we simply show them what we want them to locate. It might seem like it would be difficult to transition your puppy from games to actual tracking work, but it really isn’t. Because of those games, your puppy knows how to use his nose already. You’re just going to be showing him where to use it. 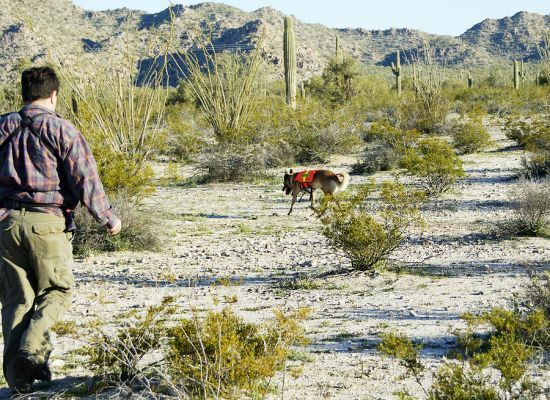 There are many ways to train in tracking, and different dogs sometimes require different methods. Very intense and focused puppies and dogs might track short distances for their toy, but for the majority of dogs, utilizing food to assist the dog is a good idea. Food drops are the tiny morsels of food you lay inside the track line. This way the dog is motivated to move forward for food drops, but at the same time the dog is scenting what is with the food. 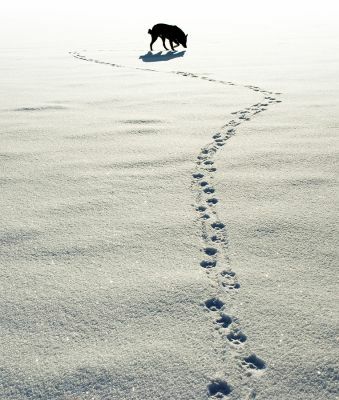 You can start tracking by laying your own tracks, but it is also a good idea as your dog gets more advanced to have friends and family members lay tracks for you too. These first tracks will be simple and are normally just a straight line track with no turns. Have your dog nearby in a stay, crate, or being held by someone so that the dog can watch. Start by showing your dogs the goodies and an article. An article is just a small object that will be placed on the track for the dog to find. Start with something fabric like a sock or glove initially. These hold scent well and can be filled with food. Excite your dog like was used for the puppy games. An excited and frustrated dog works harder out of the gate. Food morsels for the track. Two articles. One is for the track for the dog to find. The second article is your scent article (has to match the one on the track so both articles have the same scent) to show the dog. Place the second article inside a small plastic bag and seal it to avoid contamination. A tracking harness (should be on the dog prior to laying the track). Place a flag at the start of the track. Take one step forward and place a treat in the food step as you move your foot forward. Continue to take very small steps forward (to keep the scent close together) and place several food morsels in each step. You want the footprints close together, and you also want treats just an inch or two apart. Walk a straight line of about 10-15 feet laying the track the whole way with food. Place one or two flags along this straight line. Flags mark your track line, which will be more important later with tougher tracks. At the end of the track, place a flag. Also place the article full of food about a foot or two past that flag line. Return to your dog and attach his tracking line to his collar. Only attach the line to his harness when you are at the track! You want the dog to understand that tracking begins when you hook to the harness, so you should only attach to it at the start line. You will also switch back to his collar at the very end of completing the track. Right at the front of the track, pull out your second article in the plastic bag. Open it and place at the dog’s nose for him to scent it. Give him a moment and say Find It. Move towards the start of the track and if need be, you can point out the track line beginning. Stand still and allow him to move out in front of you, feeding him the tracking line so that you maintain distance behind him. Because this is a short track, he might rocket right through it! When he gets to the placed article and is smelling it, tell him Good Find It! It is important that your dog learn an alert signal. This can be a sit, a down, or picking the item up. Whatever you want your dog to do, ask him to do it before he is rewarded with the food out of the item. Of course tracking work gets far more complicated than a short line track. There are turns to be added, variety of surfaces to track over and through, distractions to add in, and distance increases. These all take time to add in and require more information beyond the scope of this article to cover, but the important thing to remember is that once your dog can handle a straight line track, you should begin making that track longer, adding in simple to more advanced curves and turns, and increasing the distance between food drops (until there are no longer any food drops). A skilled dog is an amazing tracker and sight to see. If you build his training foundation right from the beginning, he will have no problem tracking just about anything.